Great Ocean View & Reasonable Too! Located on the 4th Floor (top) with a view of Kama'ole Beach III. Kam III is a family friendly beach with picnic tables, snorkeling, some shade and lifeguards on duty during the day. They also have a children's playground. We make sure this condo is comfortable, because we live here four months out of the year. The lanai is large with room to dine outside or relax in the chaise lounge. The master bedroom has a queen size bed, extra TV and its own bath. The second bedroom has twin beds that can be converted to a king (king linens provided). A Luxury hotel $500.00 a night, gasoline $4.00 per gallon. Why not be comfortable, feel at home and save a bunch. Cook or BBQ if you want OR go out with the money you save. Now free high speed internet (ethernet or wireless) is included. Free telephone calls to US and Canada. Larry and Marian enjoying an evening out. Larry's mom lived in Kihei since 1969 and we knew that we would like to spend a great deal of our time there. Although we both still love to ski and spend all winter in Tahoe we enjoy going to Maui for a couple of months after the resort closes and after Labor Day until just before Thanksgiving. Kama'ole beach parks is one of the nicest on the island of Maui. It is very family friendly with great snorkeling and lifeguards for the timid. The views from the lanai allow you to take it all in. Kamaole Beach Park III directly across the street with Life Guard on duty. Enjoy beautiful sunsets from the living room, kitchen and lanai. Kamaole Beach Park III is located directly across the street. It offers great snorkeling, grassy area and kids playground. Indoor table for 4, outdoor seating for 6 plus seating at the bar for 4. Great view and great place to stay! It was exactly as described, and the beach was only a 2 min walk away! The condo had everything we needed. Definitely making plans to come back again! We loved our stay at this Condo. We look forward to staying here again soon. 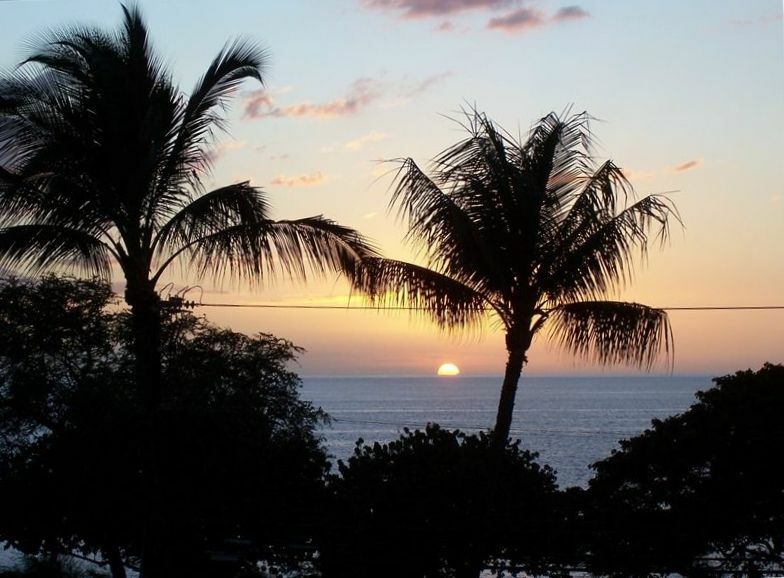 It is centrally located in Kihei and walking distance to shops & restaurants. The lanai is amazing and we spent most of our time on it. Thanks for the amazing accommodations. Great space at an affordable rate! BIG condo for the price, with sunset views every night! Large lanai, across the street from a great beach, and a full kitchen - a perfect place for a family vacation. Street noise may bother some, but it’s much quieter at night. Walkable to restaurants, an ABC store, and several beaches. Condo had everything we needed for our stay: cooking supplies, beach equipment, ice chests, etc. Definitely would choose to stay here again. Super bien situé dans l’ile de Maui . Kihei est une ville fantastique très familiale . Il y a tout ce qu’on a besoin dans l’apartment . Merci Marian . This property at Maui Parkshore was ideal for our purposes. As a family of 6 we wanted a comfortable and clean space with full kitchen and in-unit washer/dryer, a water view, easy access to the beach, and close to fun stuff to do. Our stay was wonderful. Right across the street from Kamaole III park, we found it so easy to wander over at any tie of the day to a clean beach with turtles, surf, and more. As a home base, Kihei was perfect whether we were braving the Road to Hana, touring Ma'aela Bay, or Lahaina or just making the run to Costco for supplies. Both the owners and the onsite management were attentive, friendly, and helpful. We loved it!